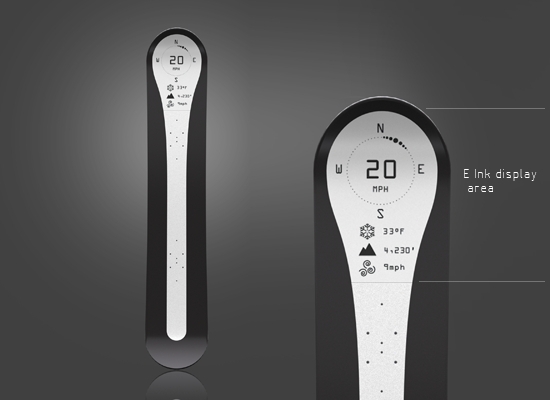 The new concept E Ink Surf segmented display Ride snowboard by Continuum and developed by Espon is total Sports Techie. 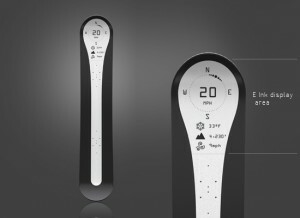 This prototype snowboard tells the time, speed, direction, mountain temperature, altitude and weather forecast data, plus has an e-mail inbox using bluetooth that can be read on a low powered technology flexible screen integrated onto the boards nose which syncs with an E Paper watch or smartphones. The display is high contrast, low profile, direct sun readable and powered by a piezo-electric generator. Power is created by riding, bending or jumping on the board. Whether you are bombing down the slope, doing big air in the halfpipe, or chllin on the chairlift on the way up to do your runs, real-time snowboarding data will now be available to analyze and share with your peps via the new concept E Ink snowboard innovative sports technology. Snowboard concept by Continuum at E Ink. Ride Snowboards web site: http://ridesnowboards.com/. E Ink snowboard concept pictures at SID 2011 by Engadget. Be sure to come back and visit this Sports Techie blog to find out when this awesome E Ink snowboard concept finally become a wicked reality.